Heritagem presents: This 18 karat yellow pendant locket features a lovely design with flowers. This round form matches perfectly with two portrait's pictures. There is one gold circles you can remove to fix the pictures inside, and you can also add a picture on the other side. There is no chain provided here but it could be worn with a long chain or a black ribbon. Do not hesitate to ask and we can find the perfect one you want. The clasp opens easily and snaps shut firmly. It is in very condition for an item of this period (c. 1900/1905) even though there are few traces of wears. The flowery crown is a bit tarnished but it made on purpose for accentuate the relief. I have given the locket a light polish with polishing cloth to bring out the shine. The pendant is marked with the Eagle's head the French mark for 18 karat gold. It weighs 6,5 gr and measures 35 (1,38) x 25,19 (0,99) x 4,37 (0,17') mm. The bale is included in the high. Art Nouveau's style was strongly inspired by this kind of design : flowers, nature, birds and makes any jewels of this period very poetic. All our items come with either a gemological report or a jewellery report with circa and all useful information. 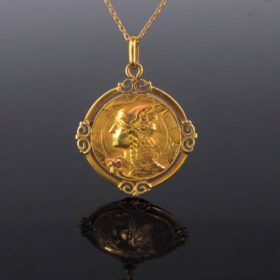 Heritagem presents : A ravishing Antique French Locket. It is composed with 2 glass circled with a 18kt gold rim. You can unscrew the hinge and remove the circle. 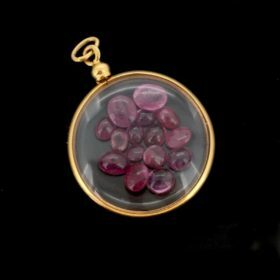 The locket contains 15 cabochon cut rubies of differents sizes. The rim was controlled with the French eagle's head and the hinge with the maker's maker but it is quite hard to read. The locket could hold 2 pictures. This round form matches perfectly with two portrait's pictures. 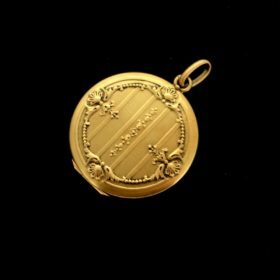 The locket weighs 3,3gr and it measures 36,24 (1,42) x 24,99 (0,96) mm (inch). It is in good antique condition. All our items come with either a gemological report or a jewellery report with circa and all useful information.